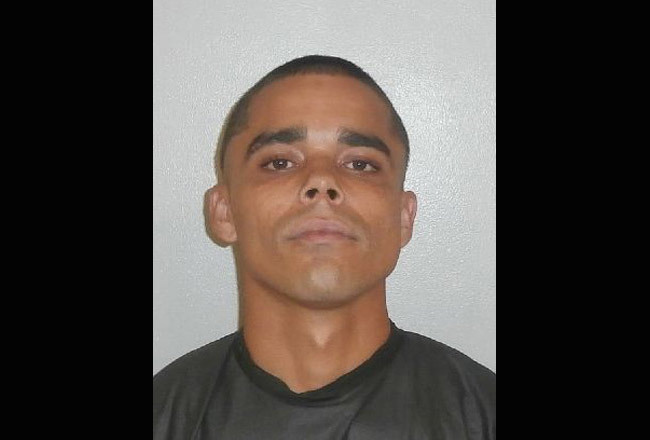 A Fort Myers visitor at the Flagler Beach Pier was arrested and jailed Tuesday evening after he threateningly displayed a gun to another man taking pictures of the visitor’s girlfriend, according to a Flagler Beach police report. Jason Torres, a 23-year-old resident of Ormond Beach, was at the pier with friends around 8:30 p.m. Tuesday, taking pictures. Connie Roberts, 31, a Bunnell resident, walked into the area Torres was photographing. Torres kept clicking and laughing. Torres, according to the report, immediately stepped away, told his friends of the incident, and called 911, giving the dispatcher a description of his alleged assailant, who was wearing a black tank top and khaki shorts. A few minutes later, Flagler Beach police spotted Wood, who matched the description given the 911 dispatcher, at South 5th Street and A1A. Wood presented his ID, along with a military ID belonging to Roberts–and Roberts’s concealed weapon permit. While Wood was patted down he said Roberts had a gun in her purse. With Roberts’s consent, an officer retrieved the weapon, which was loaded with a live round chambered, the report states. Another officer brought Torres to South 5th, where Torres positively identified Wood as the man who’d allegedly displayed the gun to him on the pier. Wednesday evening Wood remained at the Flagler County jail on $2,000 bond. He was arrested in June 2011 in Lee County on a battery charge. I’m all for the second Amendment, but it’s morons like this that make me second guess it. Flagler County aka the wild,wild west and getting worse by the day. It’s getting dangerous to go out in broad daylight. You wanted out of county visitors, you got them and because you don’t charge non residents for parking or beach access, you get the cheapest and lowest level of visitor. @ elaygee, I know what you meant but cheapest doesn’t always mean lowest level. It is getting harder and harder for families to be able to afford things anymore. This does not make them low level. It makes them poor, a designation which is rapidly spreading in this country. It seems like there are more morons and creeps out there with guns than there are normal people. Saw on the news 2 young teens killed someone because they thought it would be fun. As all these guns keep being used for the wrong reasons, it will soon be just accepted as a way of life and people will just develop a nonchalant attitude towards the way humans act. This man has anger issues and should NEVER be allowed a concealed carry permit. He is going to kill somebody. Well, considering he didn’t have a concealed carry permit, and that didn’t stop him from carrying anyway, I don’t see how him not being “allowed” a concealed carry permit has anything to do with anything. The guy is a criminal, a bully and a wannabe thug, and as far as I’m concerned, throw the book at him. Jam him up good. Know the feeling same junk happened with a guy and a camera and my wife. However, we left. He should have just left, he let the pervert win. Another idiot with a gun. I am surprised the Flagler Tea Party has not offered to pay his bail or legal fees in this case…….after all, he did have a gun…..permit or not. I wish there were a lotion for this recent rash of gun stupidity. It’s idiots like this that make responsible CWP holders look bad. I guess that picture taker-made him fear for his life. Ban cameras! As a legal gun owner and a responsable one at that, this is the type of person who makes us look bad, why did she let him hold her gun? she should have know the law if she had a CWP. Guns do not kill people, but morons with guns do and that is the real problem, we will never solve it because there is no way to keep guns out of scumbags hands. I would have SMACK the camera out of his hands and thrown it in the ocean. I’m sick and tired of “invasion of my privacy” regardless if I’m out in public. That’s another reason this country is FAILING. No respect for anybody. So by extension, you think what he did was okay and an appropriate course of action? You have exactly zero expectation of privacy in a public place. Period. I do find it interesting that you think physically battering someone and destroying their property over a perceived slight is in any way respectful, though. If you don’t want your girl photographed, don’t let her walk in front of the camera, plain and simple. Sarge: Had you done that, YOU would be the one going to jail. The law allows a person to photograph anything they choose as long as they are on public property or on private property with permission of the owner. No permission is required from the subject of the photograph unless the photo is going to be used in an advertisement or other for-profit enterprise. You can even take a picture of private property — say the apartment with the orcas painted on the side — without permission as long as you’re standing on public property — say Veteran’s Park — when you do so. I know this because I take a lot of photographs wherever I go and make sure the local laws support me. Ok Voice of Reason that’s all very nice for you. But, don’t let me catch you snapping a pix of me or my family without my or their direct pemission or you just might be in for a loss of photo equipment. It doesnt matter where you go or how much you pay for parking your gonna have idiots everywhere. Enjoy the freedom of carrying a legally concealed weapon while you can. It’s all going to come to screeching halt because of all these downright dumb human-beings. And I don’t just mean the pistol packers. I’ve said it before: too many people are willing to hurt and be hurt. When you carry a pistol, you need to be more tolerant of bullsh**–not less, like many believe. You need to shy away from encounters! The whole point of carrying a weapon is to help you get home, just like you left it. It is for neutralizing or countering deadly force–not stupid would-be photographers. Just walk away for goodness sake. This guy can’t afford his bail, but he can afford to own a gun ? Something is wrong with this picture. Im convinced that concealed carry permits should be issued like a drivers license. take state certified class. include proper use rules and laws for self defense. And test. People are under the wrong impression that a gun is a toy to them. Wean out immature, and un educated people. Parents lock your guns from your kids. Sarcasm? Or irony, considering that’s exactly the procedure in something like 96% of the country, at this very moment? They dismissed the case!!! I wonder why?? ?